Strangely enough, Duke Nukem 3D is the third instalment in the Duke Nukem saga and, in a dramatic break with tradition, appears to be largely three dimensional. Of course, this is good news for Duke who is now able to develop a little more depth and understanding, the caring, Oprah-loving bloke that he is, and it's also rather good news for the legions of adoring female fans milling about in computer game er... world, for various reasons not altogether unrelated to somewhat sordid activities which won't be mentioned here. 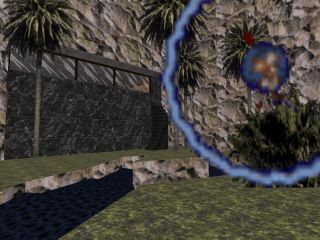 The release of DN-3D in 1996 heralded the beginning of a new era of interactive 3D games and rivalled many other similar games of its time, including Frogger 9000, throwing rocks at each other and Doom. Duke's witty one-liners and the humorous environments in which the player was free to roam (you tell me there's nothing funny about an alien cavern in the mountains) added to the character's likeability (Oxford Pocket, eat yer heart out) and indeed did wonders for the game's fun factor and replay value. How many of us as gibbering teenage idiots fell over ourselves repeatedly hitting the use key on the Duke II arcade game in the first level? And not forgetting the dancers, of course. A young man's crash course in How To Talk To Strippers 101, taught by Duke Nukem himself. The game has aged well, with modern ports and high resolution upgrades available, and although the legion of Duke Nukem fans has dwindled over the years there still remains a core of enthusiasts keeping that old Duke flame going. If you're such a one, stop reading this drivel and go hunt down a map we haven't got here (then send it in, of course), but if you've somehow never heard of the game to which this website is dedicated head on over to the shareware page to grab a copy of the demo. You may or may not be pleasantly surprised to some degree. Aliens have landed in Los Angeles. This has made an awful lot of people very unhappy and has widely been regarded as a bad move. The sewage systems are under considerable strain and video stores are all sold out of ex-rental X-rated feature films, and it would appear as though the Earth faces some kind of moral dilemma; to wipe out a fun, peace loving alien race with an ineffable appetite for spicy nachos for the sake of a few overworked sewage workers or to continue along a deadly path, possibly risking what is known as the Nacho Event Horizon, a situation in which it becomes economically impossible to construct anything but vendors of Mexican food. When the aliens begin stealing hot babes and cocooning them to death, the Earth Defense Force decides to enlist the help of one Duke Nukem: an intolerable xenophobe with a size thirteen boot and another one to match. The game takes you to alien infested L.A., an orbiting space station, the surface of the moon and to various other delightful, friendly urban settings. Along the way you'll meet many an ugly foe, which you will certainly need to kill, not that this presents a problem. Duke must fight for what is sacred! To use the cliche, it's time to kick some serious arse! Duke Nukem 3D utilises Ken Silverman's Build engine, which was also used for various other games such as Blood and Shadow Warrior. As a result of his success, Ken now lives in a pink house with lovely orchids and is extremely popular with the ladies, especially tall disproportionate ones. In the eyes of any self-respecting Duker, this man should be respected as a kind of deity - him and the chaps at 3D Realms - we owe them a bunch.